I am very excited to take several groups to Central Asia in September and October to explore the fascinating Silk Road countries and watch the 5th Asian Indoor & Marshall Arts Games in Ashgabad, Turkmenistan. These games will be held from the 17-27 of September hosting 500 athletes from 22 countries competing in 21 different events all held in a multipurpose sports facility featuring 30 venues. This year sees the new addition of exciting E-sports, so make sure to get in on all the action with us as part of our Central Asia Tour to Uzbekistan, Turkmenistan and Kyrgyzstan. This tour features Ashgabat which is a fascinating window on the ancient culture; a marble-clad capital city that rises from the desert steppes and set against the rugged Kopet Dag Mountains. Golden statues, striking monuments and world-record breaking sites, even an 8km walking path along the hills south of the city and ornate telephone booths which wouldn't seem out of place in a sultan's palace. Ashgabat boasts an array of excellent international restaurants along with its entertainment centers and lavish hotels. Our local guides connections will ensure best-seat tickets and hard-to-get reservations! The region has vast resources of Natural Gas which funds the government to build this showcase city, complete with its falcon-shaped airport.At times Ashgabat may seem more of a movie set, you'll find the hospitality of the people of Turkmenistan is legendary. It is a place where you can stop in for tea or enjoy local Turkmen cuisine. A traditional meal would include flavorful shashlyk kebabs, savory plov (seasoned, slow cooked rice with meat and vegetables), meat or vegetable manty dumplings and of course, the refreshing, sweet melons of the region. Recent presidents of Turkmenistan have prioritized the revival of Turkmen culture and visitors can experience its rich history and traditions in the bazaars, medieval cities, and ancient caravansaries around the country. This is a country of traditional equestrian culture and the Akal-teke horse is the national emblem and the hippodrome holds horse racing events every weekend. This country's astounding natural beauty craves your attention. A must-see is the incredible Dervaza Crater in the desert. Still burning since geologists thought to burn off the escaping methane gas in the 1970's, it makes a surreal vision at night, aptly nicknamed "The Door to Hell". For contrast, then head to the Caspian Sea to Turkmenistan's port of Turkmenbashi where new resorts on sandy beaches and turquoise waters beckon. Silk Road Treasure Tours has been taking visitors to Central Asia for longer than any other travel agency. This is our homeland, we know the ins and outs of Turkmenistan which helps us take care of your visas and border crossing procedures to ensure they are smooth and routine. Our in-country experts will ensure seamless travel throughout this incredible tour. 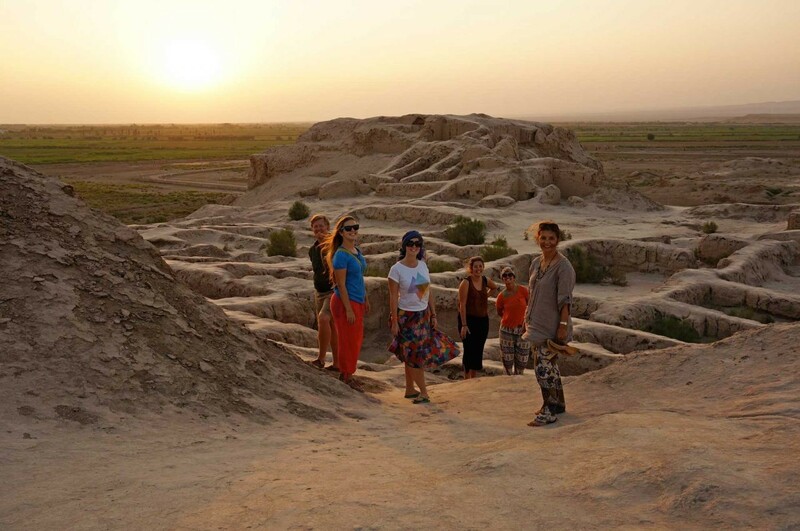 Our experienced, multi-lingual guides will be your hosts in Turkmenistan, and Central Asia and the games, they will be there to help you explore these amazing landscapes with their centuries of culture and tradition. Join our Silk Road family to enjoy once-in-a life-time Silk Road journey.